This entry was posted in Promotions and tagged 888 Poker 888 Poker Promotion Code 888Poker Download 888 Poker Winter Games Freeroll on February 19, 2014 by Andrew Radue. Every players gets their first Winter Games Freeroll tournament ticket for free, use the ticket to play for a $10,000 prize pool during the promo dates. Casino Games – Wager at least 30 bets on any 888 Casino game. Only one ticket can be earned per day, qualify for the final freerolls by earning the required amount of tickets during the promo dates. Earn 3x Winter Games tickets for a $20,000 Bronze Hero Freeroll ticket for 3rd March. Earn 5x Winter Games tickets for a $30,000 Silver Defender Freeroll ticket for 6th March. Earn 8x Winter Games tickets for a $40,000 Gold Champion Freeroll ticket for 8th March. Players that earn 8 Winter Games tickets will get tournament tickets to play all three events with $90,000 in prize pools to be won. 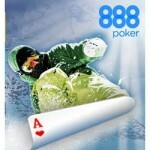 Make a first deposit of at least $10 using 888 poker promotion code – EXTREME and get five Winter Games Freeroll tournament tickets, this offer is valid until 26th February, 2014. Tickets earned by depositing do not count for qualifying for the Winter Games Final Freerolls.